Recently described as “an oven company unlike any other” by British GQ Magazine in a recent review, Harrison Ovens are a family-run business which embodies the spirit of artisan British craftsmanship. 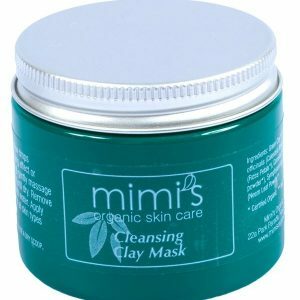 The brand rejects the high-volume mass production offered by faceless corporations all over the world, favouring an authentic, hands-on, and personal approach. Each Harrison Oven is lovingly handmade between London and Ramsgate, Kent, having recently moved some of the manufacturing from their original home in London, to both a high performing and perfect degree; there’s certainly no sense of style over substance, when both are equally impressive. 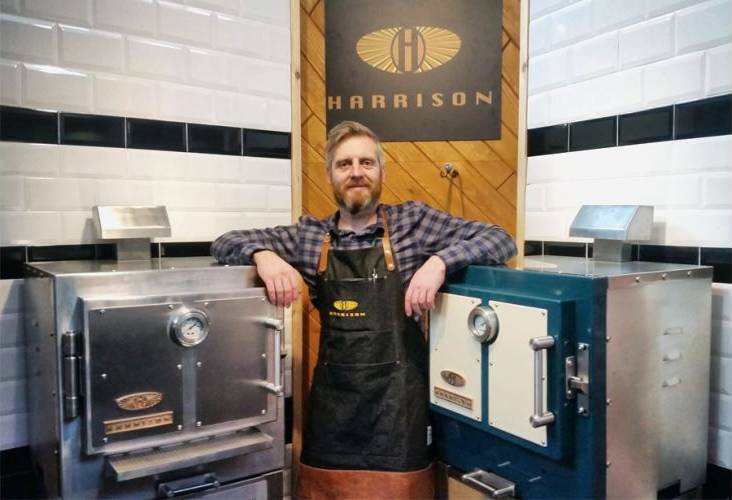 Harrison Ovens was founded by real-fire cooking enthusiast Daniel Thumwood, whose particular interest in cooking in traditional ways using solid fuels started him on the path to artisan oven success. Deterred by the cumbersome and uninspiring nature of professional charcoal ovens, Daniel sought something different which would fulfil the same purposes and fit expertly into high end amateur cooks and boutique restaurants with open kitchens. 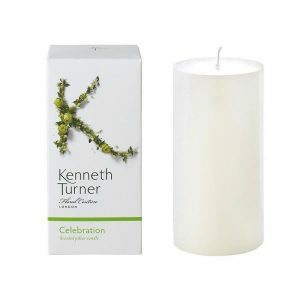 Daniel comes from an artful background, having studied renaissance art history for 6 years. It was these foundations upon which Daniel built his empire, combining his love of art with a love of cooking and his abilities in the fields of artisan metalwork. In the company’s 4 year lifespan – (nb: the ovens have been in development for 4 years, the company was incorporated in May 2016), Daniel is regularly involved in every stage of the creation of Harrison Ovens, working alongside his father George, a veteran to the craft. 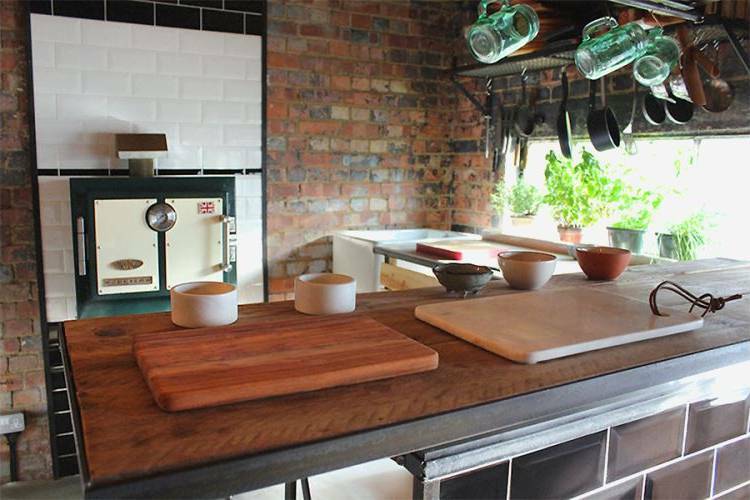 Each oven is made by hand and personally tested and approved before it leaves Daniel’s workshop and is given its certificate of authenticity. The end result? 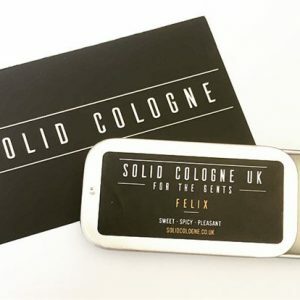 A superior, luxurious artisan British product, which Daniel feels reflects the care and character, the perfections and imperfections, of their creator. We at Harrison strongly believe that artisans are now the game changers. In a world of mass-production and high-speed living, our skills go back to a time of authentic, step-by-step methods. 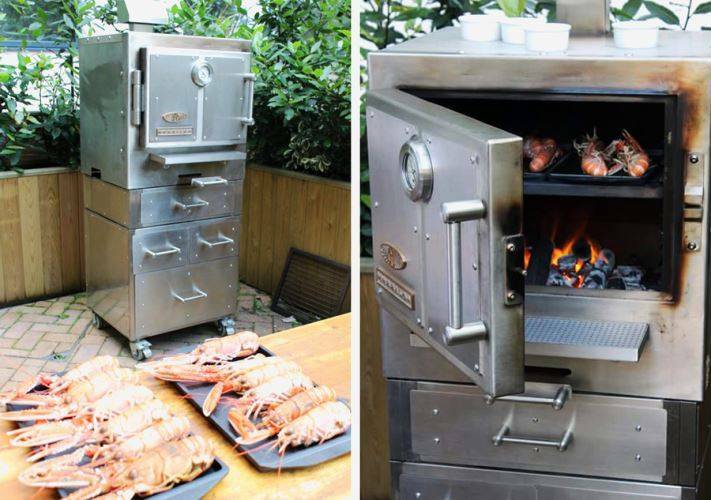 I designed and developed Harrison initially, for my own use, but interest has been so overwhelming, that I am now offering to make limited numbers of this beautiful oven, for creative and innovative chefs, both amateur and professional alike. So what makes Harrison Ovens so special? 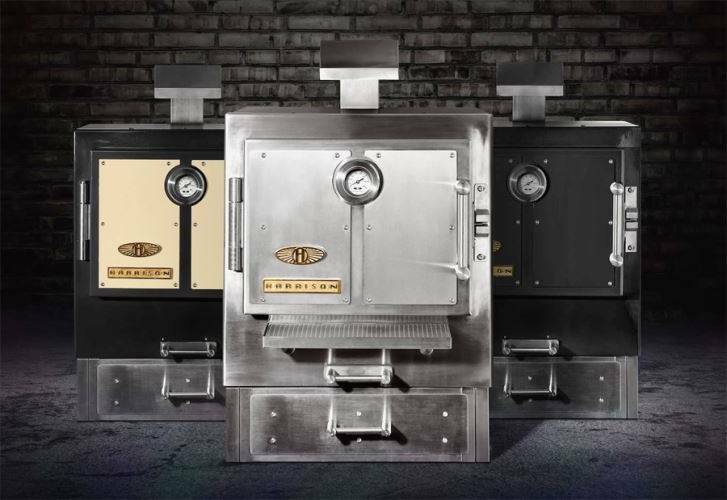 Aside from their traditional aesthetic, bringing a classic style into the modern era in an age where what’s ‘vintage’ is considered fashionable, each Harrison Oven has its own serial number, a log book and a certificate of authenticity which re-enforces the personal relationship between the brand and the customer. To emphasise this relationship, each certificate has been both signed and wax sealed by master craftsman Daniel Thumwood, who builds each Harrison Oven by hand. This handmade approach ensures that no two Harrison Ovens are ever the same – each has its own character, its subtle imperfections and its cooking personality, delivering unique meals and flavours which it would be impossible to replicate with the highest quality oven. You truly develop your own taste. However, Harrison Ovens are not simply a cooking device – blending effortlessly into any kitchen, each Harrison Oven serves as a piece of furniture, turning heads as guests admire it and is sure to be a guaranteed conversation piece. Each oven is designed and crafted to perfectly complement the most sophisticated kitchens and gardens across the world. Delivering not only the most sumptuous meals, Harrison Ovens are sure to bring a sense of creativity and wonder to any social boutique they become a part of, or boutique restaurants, endlessly entertaining guests and inviting questions. Perfect for any colour scheme or theme of kitchen or garden, Harrison Ovens are available in a number of aptly named shades including squid ink, moules, borsch, venison, parrot fish, kale and horseradish. 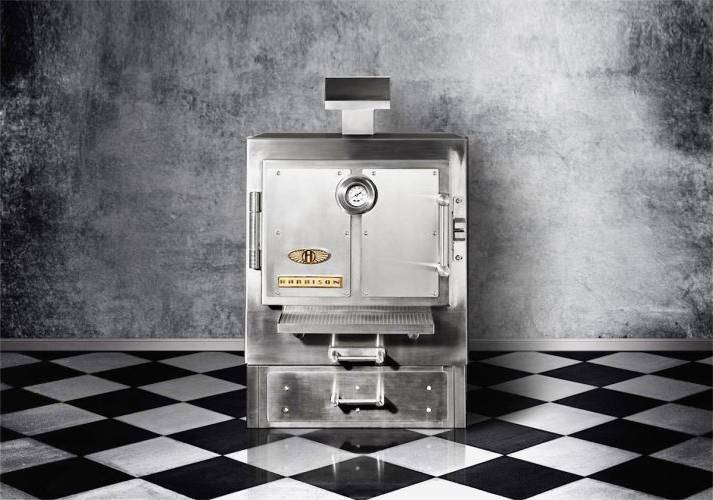 A traditional stainless steel Harrison Oven is available, known as the Harrison ‘S’. For those seeking a vintage feel to their Harrison Oven, the British brand offer a natural looking walnut and oak base cabinet, or a classic stainless steel. More cost-effective than other mass-produced closed chamber ovens, Harrison Ovens start at approximately £5000. An investment such as this guarantees quality, homemade delicious food in a handmade oven, and joining the ranks of the elite, where both amateur and professional chefs find themselves since investing in Harrison Ovens. Why should you invest in a Harrison Oven? Harrison Ovens are closed chamber, solid fuel ovens, which makes them the perfect combination of an open grill and a conventional oven. This type of oven can be found in top restaurants all over the world, ensuring every meal is of gourmet, Michelin star quality in the comfort of your own home. During the cooking process, the closed chamber aspects of a Harrison Oven allow heat to travel around the walls of the oven through convection. This means food cooks evenly and quickly on a high heat, while retaining moisture, succulence and flavour, without the flare-ups associated with an open grill. With a closed chamber, solid fuel oven, you can cook practically anything your heart desires – meat, pizza, fish, cake, bread – the possibilities are endless. When cooking inside a Harrison Oven, all of these delicious meals and more would be infused with delightful smoky lashings of flavour. The use of a Harrison Oven is also cost effective – charcoal saves money as it’s cheaper than both gas and electricity to cook at high heats, while saving the environment as an organic, natural and non-toxic substance. 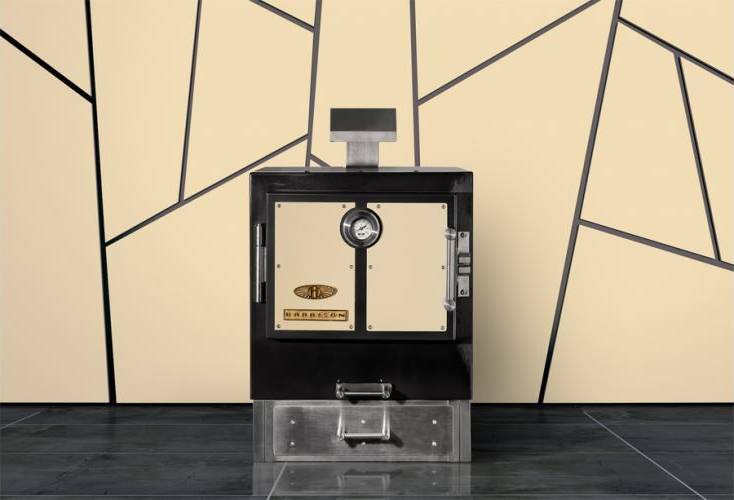 The brand themselves often utilise a Harrison Oven to roast coffee beans and smoke cheese! Harrison Ovens are incredibly easy to clean – all the waste falls into an ashtray beneath the main chamber, and can be disposed of quickly and easily. This waste has no impact on the environment, and can be particularly useful when scattered on growing vegetables.